Directions Located in Lagarde Park, Anniston, Alabama, at the junction of Highways 431 and 21. From Interstate 20, exit 185, 7 miles north on Highway 21. Allow 1-1/2 hours driving time from Birmingham or Atlanta. Admission $4.50/Adult; $3.50/Child (ages 4-17); Free for children 3 and younger. Discounts for Seniors, AAA members, and active military. Penny machine is inside building outside of the giftshop. 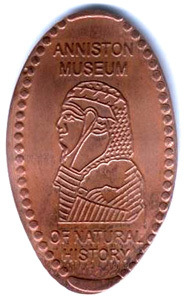 You do not have to view the museum to use the coin press. thegillion added Anniston Museum of Natural History to system.